Through this exercise, students who are new to cultural anthropology, get a better sense of general aspects of a culture. For example, they will learn that a culture may have a number of different, yet similar sounding names (e.g., Shluh, Shleuh, Chleuh, Chleuch) or are referred to by completely different names (e.g., Sous for Shluh). These alternative names are referred to by cultural anthropologists as “ethnonyms.” In exploring the culture summaries, students will find that cultures and ethnic groups, although located in the same geographic region, may vary significantly in their cultural identity. Before beginning with steps 1-3 of the following exercise , you first must log on to HRAF’s online ethnographic database — eHRAF World Cultures by clicking http://ehrafworldcultures.yale.edu. Step 1. 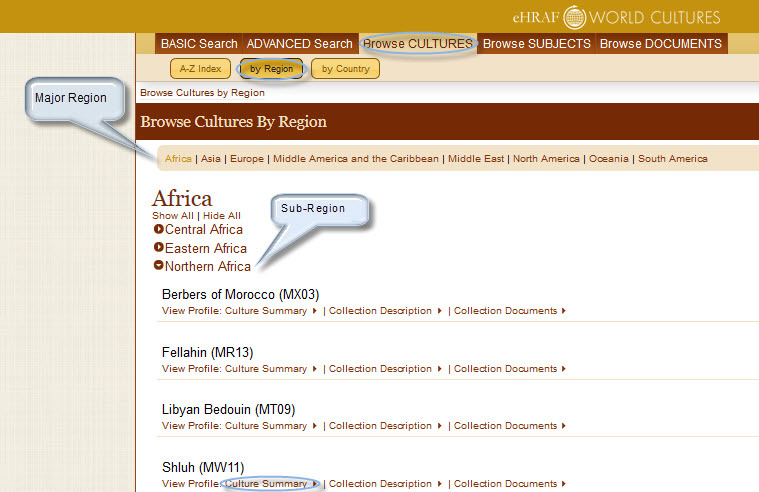 Once you have entered the eHRAF World Cultures database click the Browse CULTURES button on top (see Figure 1 below) then click on the by Region button (e.g., Africa). To get to a culture name you then have to click on a sub-region button (e.g., Northern Africa). This will open up a list of cultures,ethnic groups, and indigenous people for a particular region. Figure 1. Screenshot of steps (see light blue circles/call-outs from top to bottom) in the Browse Cultures by Region. Step 2. Each culture has what’s called a Culture Summary. A Culture Summary has a short, encyclopedia-style entry on various categories, including ethnonyms, identification and location(or alternative names for a culture, see blue circled header in Figure 2) and more as displayed in the list above. Step 3. Pick three cultures from the Browse Cultures menu for one specific sub-region (see Figure 1). Once you have picked your culture names click on the Culture Summary of each to choose any four categories. The bulleted list above gives an overview of all categories which can be found in a Culture Summary. Use the text from the categories to compare and contrast general aspects of the three cultures you have chosen. Trouble logging in? Get help here. How do parents around the world teach children to control their anger?